(This is a poem dedicated to the misunderstanding of the Pit Bull dog)... it is better we all keep safe, and know about the background & history of a dog with an incredible history. Sometimes it is better to find out about each dog breed's bite history & aggressive issues before we purchase them or adopt them. 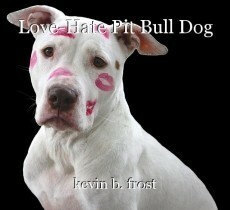 I stand neutral on the Pit Bull dog. There are good ones & bad ones. I have worked with some that are insane / aggressive and others that are quiet and submissive and beautiful, no different than a Poodle. Some people make mistakes and the dogs bite people. We should all be responsible for our dogs. It is a tragedy, people die from dog aggression & dog bites. Does he care about people? Are the Pit Bulls O.K.? in your home? A cookie and a dose of love? © Copyright 2019 kevin b. frost. All rights reserved. "I Could Be With You Forever"
This page was created in 0.3593 seconds.